In this second post in the Davao Genealogy series, we explore the baptismal records of the San Pedro church further. Due to the limited time we will limit the records only to the first 100 baptisms. From these we can see some very interesting tidbits about the first few years of Nueva Vergara, or what is now Davao City. 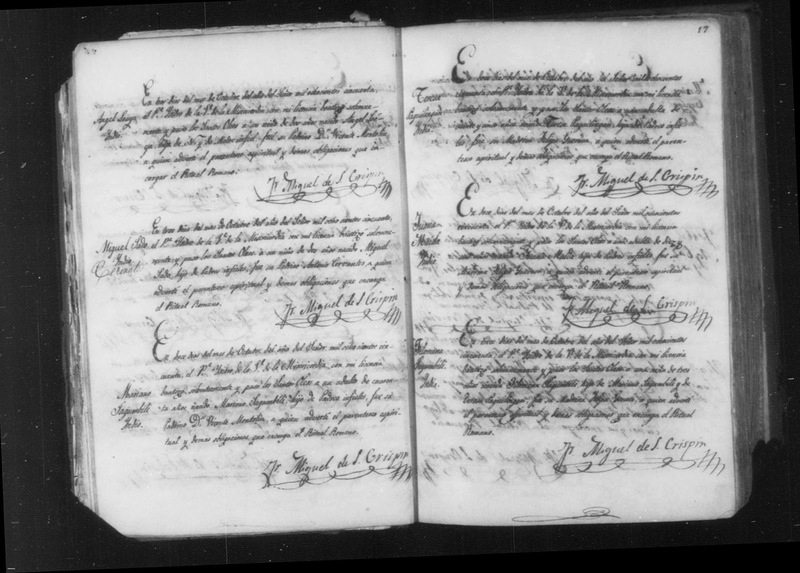 Similar to the first in this series, this will simply make use of archival documents from the San Pedro cathedral. The ratio between sexes for at least the first 100 baptisms of Davao is almost 1:1. 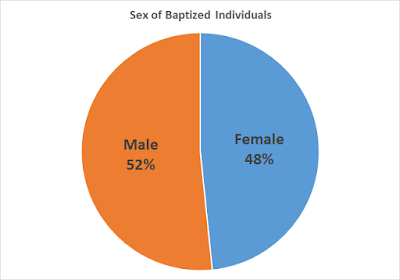 There were 52% males who were baptized from at least 1848 to 1851 with only 48% being female. 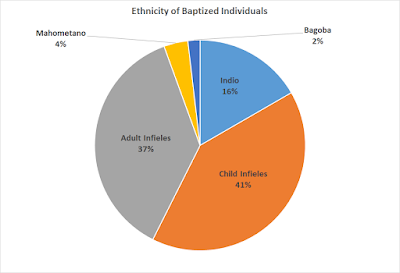 Among the local gentry who sponsored baptisms, there appears to be preference for sponsoring females than males, with all female sponsors with the title of Doña sponsoring only female children. Part of the ritual of baptism is the presence of a sponsor - a godparent - for every child baptized. In some cases there are a godmother and a godfather, but in ordinary families 1 is enough. In Davao, during the first 100 baptisms, 86 individuals acted as sponsors to these baptisms with some being a sponsor more than once. 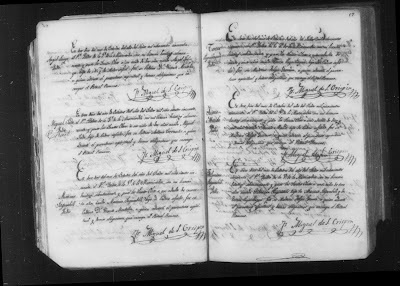 Doña Luisa Azaola, Doña Margarita Abad, Don Vicente Montolin, Jose Cipriano Sarmento, Martin Navarro, and Vicenta de Castro were sponsors in baptisms at least 3 times, while Don Joaquin Urquiola and Felipa Garcia were sponsors twice. The conversion of the native population has always been the primary reason give by the Spanish conquistadors in establishing new colonies. Almost immediately after Nueva Vergara was established, the priests went into the practice of baptizing the locals, both children and adults alike. Among the individuals baptized, only 16 were considered indio, or children of Christian locals. Majority of those baptized in the early years of Davao City were described as children of infieles or infidels. Among these, 41 were minors while 37 were adults ranging from the ages of 15 to 40 years old. Interestingly, we also see direct converts: 2 who were baptized were classified as Mahometano or obviously Moslems and 1 was described as Bagobo. For now it is unknown how they distinguished between indio, infieles, Mahometano, and Bagobo. Despite the wide evangelization of the early missionaries in Nueva Vergara, very few families were baptized together. That is why it is very interesting that one such family is recorded to have been baptized together just a day apart. Mariano Sagumbili, aged 40 years old and the son of infieles, was baptized on October 12, 1850. On the same day, Teresa Paguilingan, 25 years old and also the daughter of infieles, was also baptized. A day later, Teresa Sagumbili, 3 days old, was baptized. Her parents are listed as Mariano Sagumbili and Teresa Paguilingan. 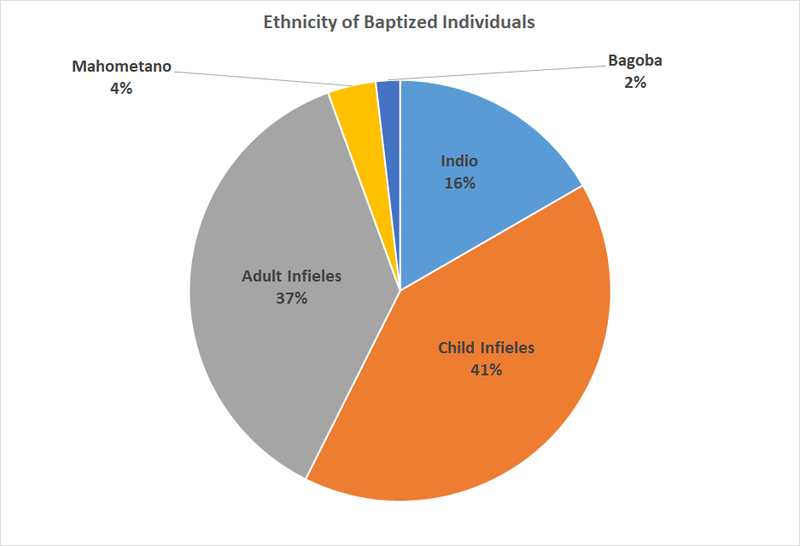 Aside from the Sagumbili family, two individuals described as Mahometano, Atanasio (aged 38) and Jose (aged 13) were baptized under the same last name, Bustamante. It is possible they were either brothers or father and son. It is interesting to note here that, if these two married and had descendants, there would be many Bustamantes in Davao today who are, in fact, not related to the prominent Bustamante family, one of the big 4 families of Davao City who came with Don Jose Oyanguren to establish Nueva Vergara.